Hepatitis C is an infection of the liver caused by the hepatitis C virus. It can cause inflammation (swelling) and fibrosis (scarring) of the liver tissue, and sometimes significant liver damage. Many people do not realise they have been infected with the virus because they may not have any symptoms, or they may have flu-like symptoms that can easily be mistaken for another illness. You can become infected with hepatitis C if you come into contact with the blood of an infected person (see below). Drug users sharing needles are at particular risk. The most common way you can become infected is by sharing contaminated needles to inject drugs. Hepatitis C is a notifiable condition. This means that when the condition is diagnosed, the doctor making the diagnosis must inform the Medcial Officer of Health. Read more about notifying infectious diseases here on the Health Protection Surveillance Centre Website. 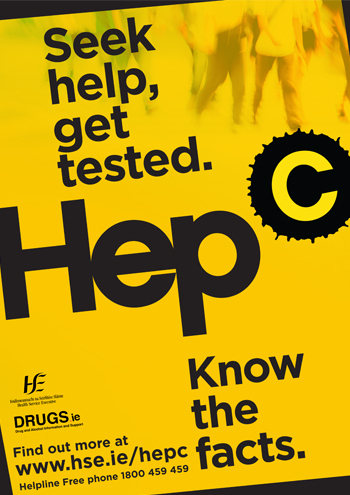 About 700-800 new cases are notified people with hepatitis C in Ireland every year. Many people do not know they are infected. The course of hepatitis C is unpredictable. About one in five people with hepatitis C will fight the infection and naturally clear it from their bodies within two to six months, experiencing no long-term effects. Of the rest, some will remain well and never develop liver damage, but many will develop mild to moderate liver damage (with or without symptoms). Alcohol consumption is known to speed up the progression of liver damage. People infected with HIV also show a faster development of liver damage. In a few people, their liver damage will progress to cirrhosis (severe scarring of the liver) over 20-30 years. If you have cirrhosis, you have a greater risk of developing liver cancer. Cirrhosis may also lead to liver failure. In this case, a liver transplant may be the only option. Treatment with interferon and ribavirin can clear the infection in approximately half of those who are infected, but there are significant side effects. You only have one liver, but it is very tough. It keeps going when it is badly damaged, and it can continue repairing itself up until it becomes severely damaged.